Mental health is always a big talking point in the AFL and unfortunately over the offseason we reached new heights. In December 2018, North Melbourne’s Majak Daw was rescued from the Yarra River after he fell from the Bolte Bridge. While we don’t know the specifics of Daw’s situation, and don’t need to, it’s understood he has been battling with mental health difficulties. The news sent shockwaves through the AFL community, which rushed to support the 28-year-old and has been by his side through every step of his physical and mental recovery. The next was St Kilda’s Jack Steven. The four-time Trevor Barker Medallist last month announced he would step away from the game temporarily to address his mental health. The support for Steven was incredible and the AFL world only wished him a speedy recovery, as they did with Daw. In the days leading up to the season opener, he returned to Seaford, which was widely celebrated across the league. In a tell-all interview with The Age’s Executive Style magazine, Martin opened up about the depression he experienced last season on the back of what was sheer ecstasy in 2017. He too was met with nothing but praise. The way the AFL world comes together to support our players in need should be applauded. But as supportive as we are – are we also partially to blame? ROBBIE GRAY (on social media): I went off twitter a few years ago because of the rubbish some people write. It's definitely an issue in the game and especially with mental health. The internet gives everyone the power to say what they like, and to whoever they like. We may be the first to support our players but at the same time, we are often the first to slander them. Like we’ve done with Jesse Hogan. 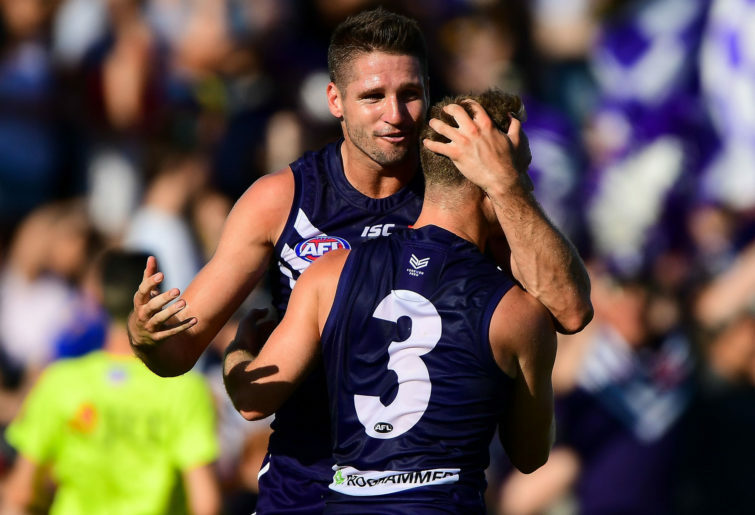 Freo’s star recruit missed Round 1 and we don’t know when he’ll make his Docker debut. We know Hogan’s absence is partially due to breaking team alcohol rules, but what we don’t know is the series of thoughts and events that lead to this moment. From the statement made by Peter Bell, it’s evident that Hogan’s mental health played a significant role. “Jesse will not be available for selection for Sunday’s game against North Melbourne at Optus Stadium while he focuses on his personal management of anxiety,” Bell said. “The club has been aware of Jesse’s anxiety and has wrapped the appropriate support measures around him and will continue to do so. It’s not like there are no possible explanations for why Hogan could be struggling. In April 2017, he lost his father Tony following a long battle with cancer. Just three weeks later, Jesse himself was diagnosed with a form of testicular cancer. These events played out almost two years ago, but you can never truly know how they have affected someone. Grief has no timeline. The 24-year-old has endured more in the last two years than many will in their lifetimes. Can someone tell me what difference is between his mental demons and those of Daw, Steven and Martin? Without the ‘fame and glory’ AFL players are simply just people. We are constantly encouraging footballers to use their platform to speak out about their mental health battles. It’s amazing how the public responses vary. What makes Hogan’s situation different from the rest? By his way of expression? Maybe he knows no other way. And if you think the men are treated badly, you cannot even imagine what’s going on with the women. Within 48 hours of the AFLW home and away season ending, retiring Collingwood player (and Commonwealth Games medallist, and former Olympian) Cecilia McIntosh was haunted by trolls in ‘hysterics’ over her eight game AFLW career. Ironically, one of the trolls who captured public attention was Josh Mellington, who played six games for Fremantle before being delisted. Trolls then turned their attention to Carlton’s Tayla Harris. The backlash to AFL7’s decision was brutal and rightfully so and the AFL world responded by resharing the image en masse. The photo has also since been re-uploaded and shared on the 7AFL account. What can you even say, other than it’s pretty damn appalling from some people but sensational support from the rest. It’s fantastic to see widespread social media support for the likes of Daw and Dusty, but then it’s often the same people who contribute to a barrage of abuse in the direction of Hogan or Harris. It’s not everyone – but it’s enough to make significant impact. We shouldn’t pick and choose when to stand with someone and when to work against them. Much of the internet is a positive space, but it’s always the negativity, abuse and trolling that sticks out in our minds. The problem? The public have a lot of control and aren’t educated enough to use their powers properly. As the 2019 season gets underway, I urge you to take the time to think about what you comment and tweet. Share your opinions and support your club but without the abuse. You’ve got no idea what any stranger on the internet or any footballer or any media personality is genuinely going through, just as they know nothing about you either. Choose your words wisely and make comments respectfully and tastefully. There’s room for everyone in the AFL but there is absolutely no room or reason for abuse.